Iraq +100 – Stories from a Century after the Invasion is yet another of Comma Press’ wonderful short anthologies introducing readers to literature from around the world (c.f. The Book of Tokyo, The Book of Khartoum etc), yet it’s a very different book to the usual offerings. Edited by IFFP-winning author Hassan Blasim, the collection brings together ten Iraqi writers, writing in English and Arabic, to imagine life in Iraq in 21o3, a century after the American invasion of the country. 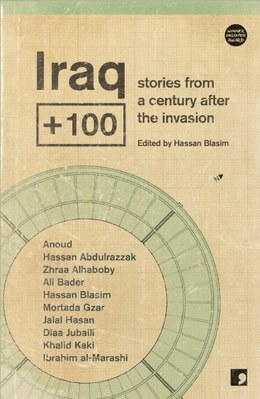 In his foreword, Blasim explains how Iraqi writing has been light on speculative or science fiction in recent times, understandable given the country’s history (there are plenty of current issues to work through without worrying too much about the future…), and Iraq +100 gives the writers an opportunity to fill that gap, and imagine how their country will look in a hundred years’ time. There are a number of imaginative pieces presented here, not least among them Blasim’s own contribution ‘The Gardens of Babylon’ (translated by Jonathan Wright). With Iraqi cities protected from the harsh climate by Chinese-built geodomes, water rebels protesting against the unequal allocation of resources and technological advancements including robotic insects that can provoke hallucinations, it’s certainly a far cry from stories of the recent Iraqi wars. It’s a little self-indulgent at times, with Blasim placing himself at the heart of the story, but overall it’s a clever take on where society might be going. However, other stories are more closely connected to today’s world, and several of them feature religion prominently. The opening story, Anoud’s ‘Kahramana’, sees a beautiful woman from an archaic Islamic Empire in the north of country fleeing her arranged marriage to the state’s leader, only to be used for propaganda purposes. Meanwhile, Diaa Jubaili’s ‘The Worker’ (tr. Andrew Leber) takes us to Basra, where the Governor (a smooth-talking Trumpian religious leader) deflects attention from the pitiful state of his city by explaining how things are worse elsewhere – and in the main square, beneath the big-screen broadcast of the speech, a familiar figure does its best to clean up the corpses. The religious theme isn’t always negatively portrayed, though. Ibrahim al-Maraishi’s ‘Najufa’ follows an American Iraqi’s pilgrimage to a famous shrine. As the doctor is taken through a high-tech Iraq which coexists peacefully with its religion and traditions, his grandfather rattles on endlessly about his own father’s journeys back at the start of the twenty-first century. It’s only when they reach their destination that the grandson realises why the old man has decided to finally make the journey himself, and technology proves to be part of the answer. “It’s from the blood of locals,’ the old merchant replied in a lacklustre voice, clearly unimpressed with Ur’s rather unrefined question. “Perhaps you should be asking, rather, what they were fed on?” he suggested. “Er, yes, precisely,’ Ur blushed. Yes, the aliens have taken over, and we’ve all become tasty morsels for the new overlords… ‘Kuzib’ is a clever story that plays with our feelings, creating telling parallels with our own treatment of animals and asking the question of how important our ethical doubts are when set against our desires. Both of the stories above attempted to combine the past and the future, but one of my favourite stories here, Zhraa Alhaboby’s ‘Baghdad Syndrome’ (tr. Emre Bennett) does so far more successfully. An architect afflicted by a new genetic disease especially prevalent among Iraqis uses a side-effect of hallucinogenic dreams to help him in his final commission, to build a city square. The story manages to integrate elements from the future (holoscreens), our present (mining social media for clues) and the past (a familiar Arabic-language tale) to help the main character track down a missing statue and create a symbol of the country for all to enjoy – even if he won’t be able to appreciate it fully himself. “We’ve changed so much,’ Samir mused, as if asking himself a question. “The world changes and all we can do is try to keep up,” Helen offered. “But have we changed for the better?” Samir asked. Ive read one of the other Comma Press offerings – A Book from Gaza – and while the quality of writing was rather patchy it still resonated with me. Even more so after I heard one of the editors speak at a literary event and then just three weeks later get caught up in yet another bombing. Brought home just how precarious a life writers in these places experience. Karen – I’ve read several of the collections (and have a couple more on my Kindle), and I love the idea of a literary city tour. I’d definitely recommend them (particularly the Tokyo one, but that’s just me!). I looked at this but wondered if I could manage the futuristic theme for an entire collection. But then I wonder if this might appeal to other readers who might not have associated Iraqi or Arabic literature with speculative fiction. Thanks for the review. I love the sound of this series and will certainly check them out. It’s rather poignant, isn’t it, to see the more optimistic versions of Iraq in 100 years? As you say, perhaps rather uncomfortable reading at the present moment, when events seem to be moving faster than the writing or the imagination. Marina Sofia – Yes, the quotation I pulled out about a fundamentalist America probably read very differently at time of writing! I had the same urge as you. I picked up Dernier refrain à Ispahan by Naïri Nahapétian. Set in Iran, written by a Irano-French writer.